Since 1964, Henrichsen's Fire & Safety has been providing companies like yours with fire extinguishers & equipment, installation, maintenance & testing, recharging, and annual service. Our clients include large commercial industries, as well as small businesses. Annual inspection is performed at your facility in accordance with NFPA 10 and Illinois State Fire Codes. One of our qualified trained technicians will inspect and service your fire extinguishers and provide you with the fire equipment coverage your company requires according to fire codes for your city and insurance regulations. Our many years of experience will allow us to determine exactly what type of fire extinguisher would work best for your specific location, and where the fire extinguishers should be placed for maximum safety. List type of service required for the next year. Annual service is intended to give maximum assurance that the extinguisher will operate safely and effectively. It includes all topics covered in our inspection, and any necessary repair, replacement and/or testing. A tag is securely fastened identifying the service technician having performed the service. Stored pressure extinguishers must be emptied and put through a full internal inspection and appropriate maintenance procedures, every six years from the manufacture date. Including a thorough examination of all mechanical parts, extinguishing agent and expellant. A label marking the 6 year inspection is placed on the extinguisher. Periodic test mandated by NFPA requiring highly specialized test equipment to ensure the integrity of an extinguisher or cylinder at its listed operating pressure. 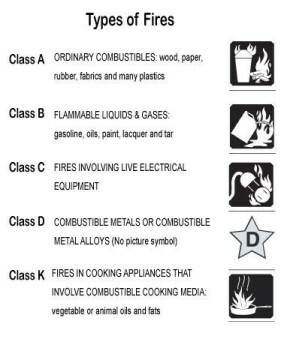 Dry chemical, Halon and other clean agent extinguishers are to be hydro tested at 12 year intervals. High-pressure carbon dioxide extinguishers are to be tested at 5 year intervals. Once these extinguisher have gone through the 12 year hydro testing a special label is placed on the extinguisher showing the year of the test.